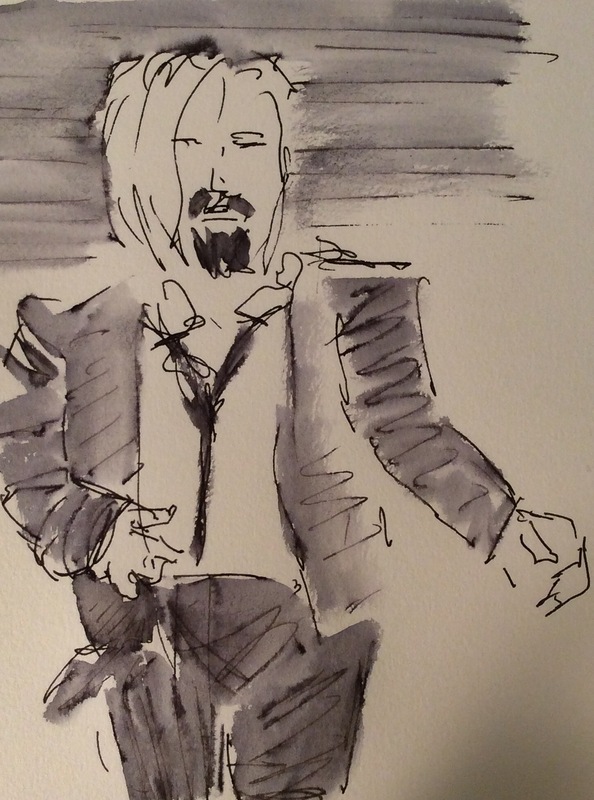 Dr Sketchy’s was themed on characters from Quentin Tarantino films. That would be those films I have never watched. Even with months of notice, I never found time to work through the canon. So from tagging on facebook and a little searching online, I can tell you that these are (in no particular order) Santanico Pandemonium, Mia Wallace, Stuntman Mike, Mr Pink, Jules and Vince and these are played by Liberty Pink, Mysti Vine, Kitten von Mew and Trampy Holford. 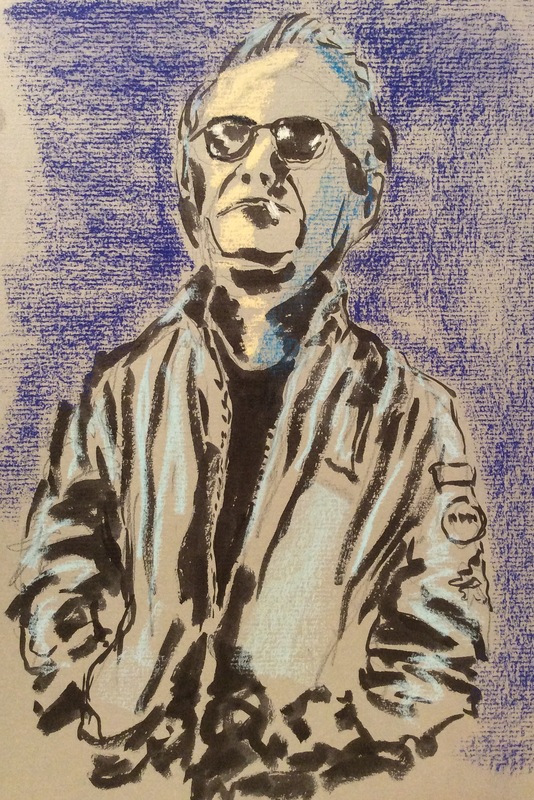 I cut down my drawing kit to Ingres textured toned paper, graphite stick, conte crayons and black ink brush pen. Stuntman Mike was the last and most sparing of the images. Mr Pink (Liberty Pink in false beard) was the first. I drew the two ten minute poses by Kitten von Mew side by side. After these I started working larger. 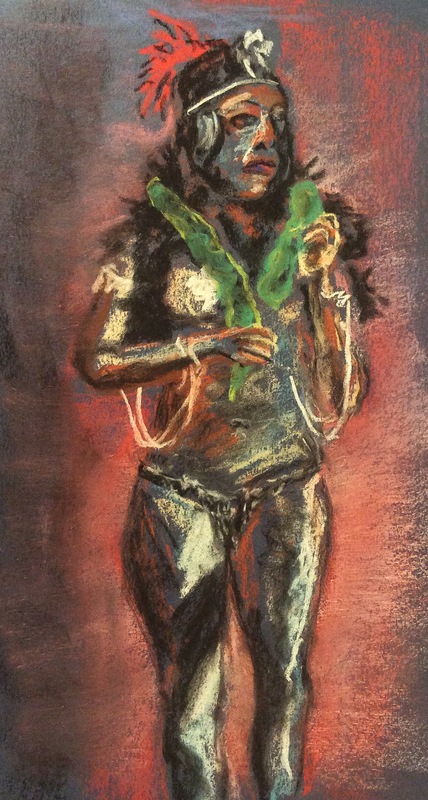 Mysti Vine (posing with her green companion “Sid”) gave me a challenge – skin reflects light with so many more hues than do clothes. 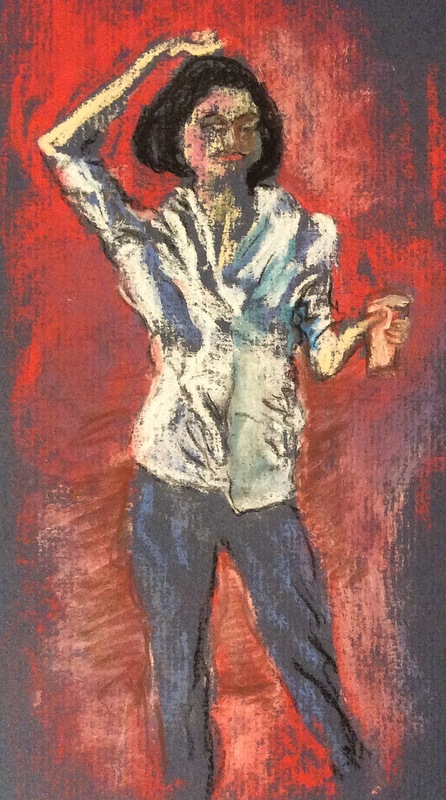 I struggled to simplify this to two or three tones which would have been more effective on the dark blue paper. 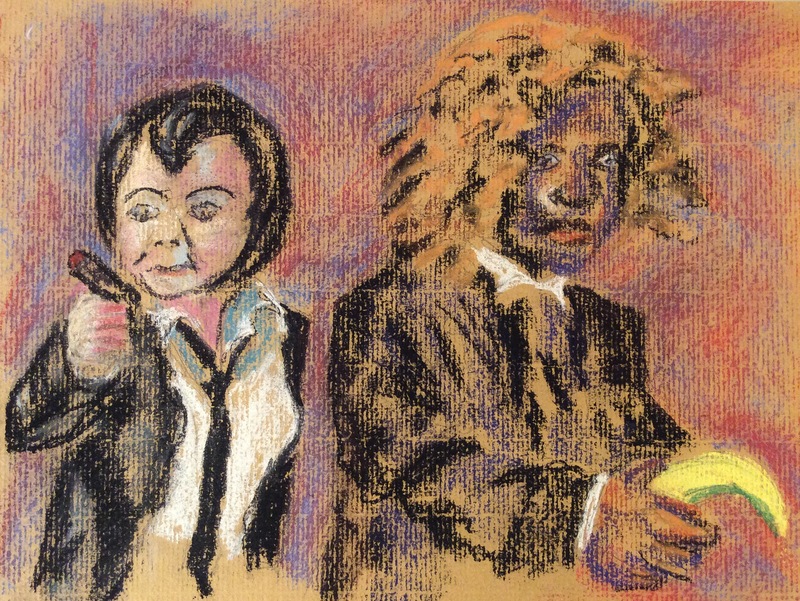 The diminutive Liberty Pink posed as hired thug Vince (John Travolta in Pulp Fiction) and Mysti Vine as Jules declaimed from the Bible before shooting us with a banana. I am not sure who was the gun toting bloke who warmed up before Liberty came on to sing at the start. Dr Sketchy’s yesterday migrated unexpectedly and with an hour or so to spare up the road to CherryReds café. The food looks great: I’ll make a point of going back sometime. Despite this (and it must have been a real challenge to the organisers), as always the team put on a great act. I saw lots of interesting good sketches round the room. 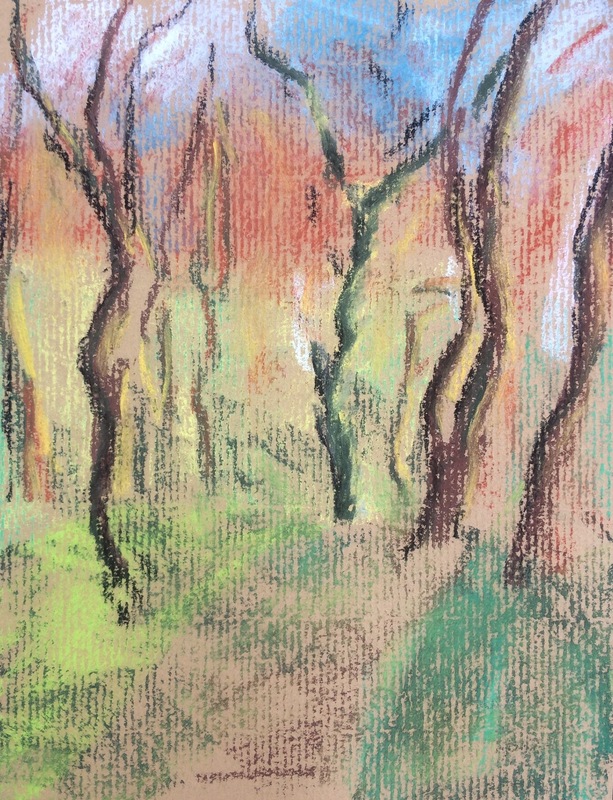 In recent sketches I have sought to capture the effects capture sunlight on and behind trees using my standard field kit of conte crayons, ink and water. In the earlier sketches, I drew on textured white paper, dampened so the crayons layer thickly and reworked the drawing later with paint. 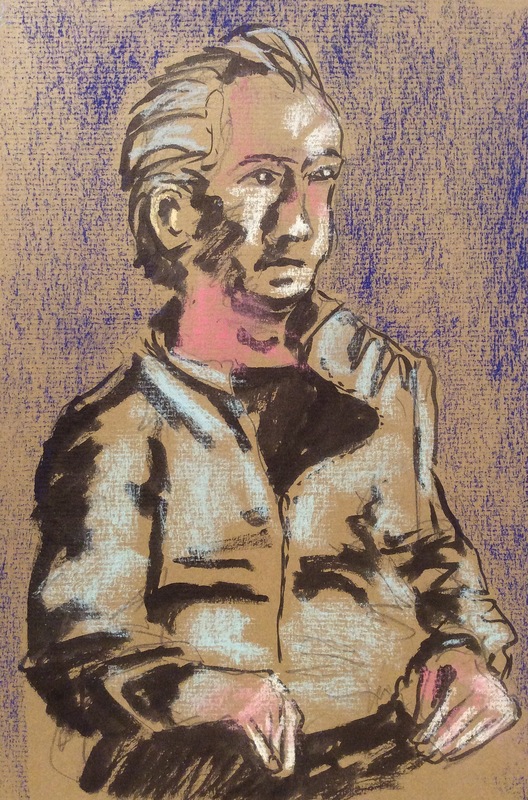 Then I started explore the use of toned paper, struggling to leave unworked negative spaces to form part of the image. The most direct inspiration for this is from the recent sketches of professional artist and blogger, Rosie Scribblah as well as the current explorations of trees in other media by my occasional art buddy, outsideauthority. Unlike my previous drawings, ones shown here are all completed in the field, not reworked at home. Last week, returning from drawing at the burial ground, I found a footpath along fields which skirted Nunnery Wood, fenced off on the western side. The evening sun filtered through the trees and last year’s undergrowth glowed. 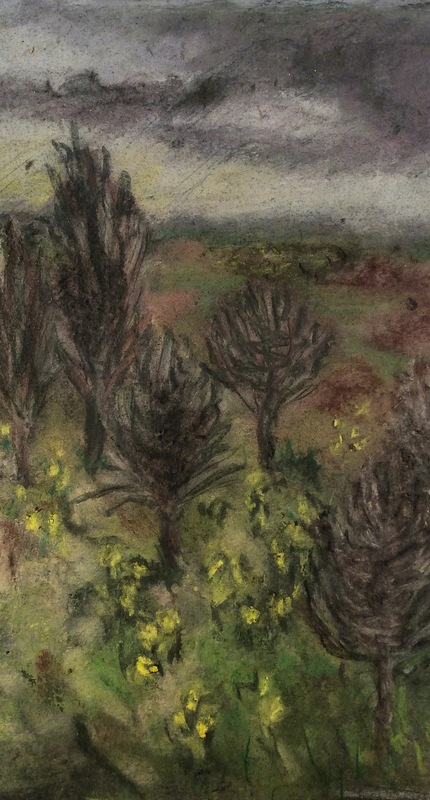 In the first sketch, at the top, the tan surface just about shows through between the short strokes of grey, an attempt to suggest the sky broken by branches into intersecting polygons. 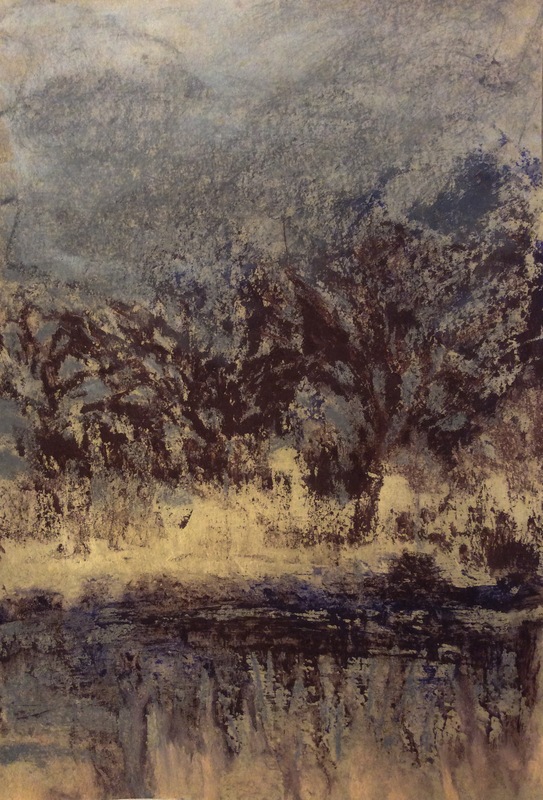 In the second sketch, the surface shows through the light strokes showing the fields but I still could not bring myself to leave the paper untouched. The next two were done today, closer to home in Sidden Hill Wood. 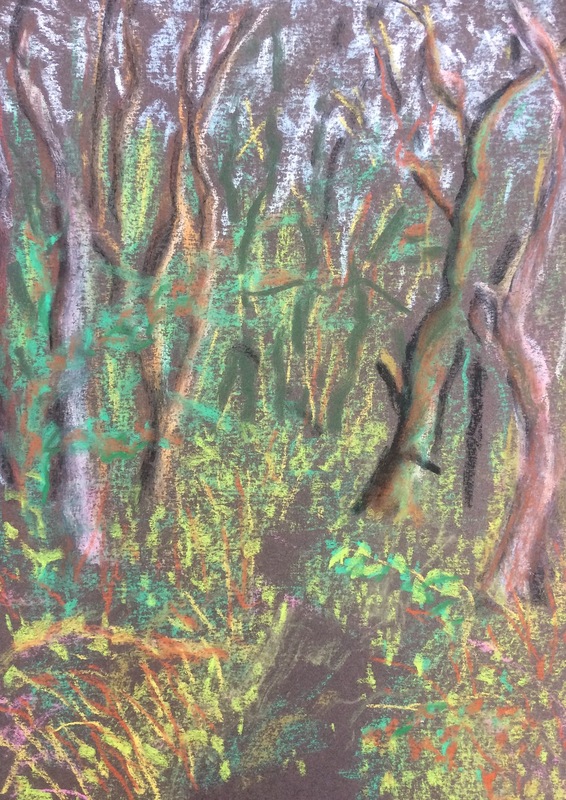 The low sun slanted in from the left so the many small branches and early leaves scintillated in the background and the nearer trunks glowed green and gold. I drew on machine-textured Ingress paper. 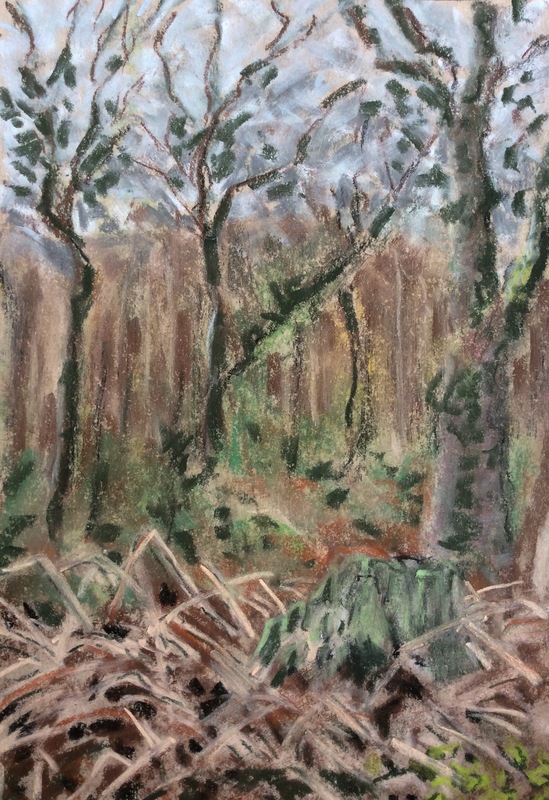 Having completed the first as well as I thought I would achieve, for the second I tried to abstract the woods into simple blocks of lightly applied colour through which the toothed paper still shows. Beneath these daffodils my mother rests. She had been gardening to within a day of her death. In July last year, all the family took a hand to carry her casket up this hill, sliding slightly in the mud. In the autumn, my sister and nephew planted bulbs above her. Last weekend, I sat on the bench looking down across patches of spring flowers and shrubs marking graves, set among taller trees, looking west across farmland to the distant Malvern Hills. 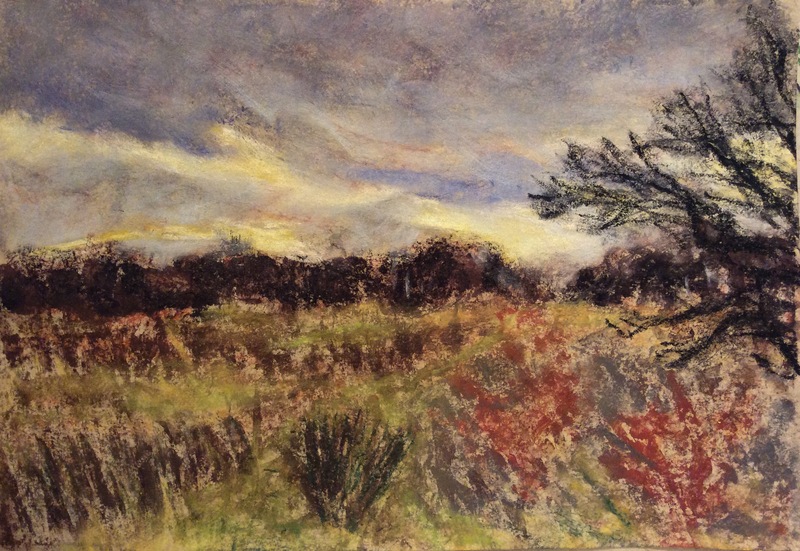 I struggled to capture this view with conte crayon on dark textured Ingres paper. It is too bright, with too many colours. At home, I kept coming back to this until I had to repair a hole in the paper and the chalked surface would take no more. I cropped the image so the broken trees lead the eyes out beyond the edge. It no longer resembles the true image but feels a better representation to me. I continued my attempt to use tinted paper to provide mid tones, using just one other hue, plus white and black, to build an image. In order to work outdoors, I bought a smaller Strathmore Toned Tan pad which would fit in my cycle bag. 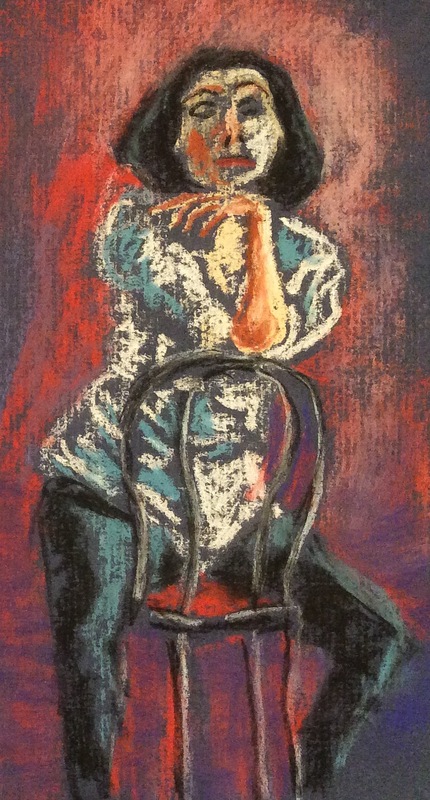 The paper is less robust and textured than the Daler Rowney Ingres pastel paper I used previously. I had cycled to what passes for a nature reserve, rough land and flooded gravel pits trapped between a business park and motorway. Traffic was thundering behind me, but I looked across a pool, rushes and a line of trees to a darkening rain filled sky. The idea was to use a grey to build the cloud and reflections in the water, leaving negative shapes of the trees. I would then draw darker brown into the trunks and branches, so they are outlined by the light tone of the paper. As it turned out, I did not have the dexterity to do as I planned. 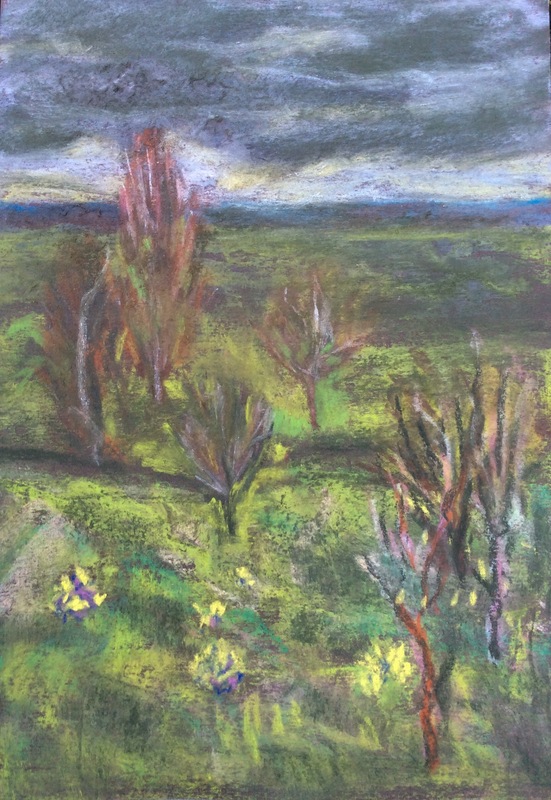 Then it started to rain, quickly dampening the paper and solidifying the crayon strokes. 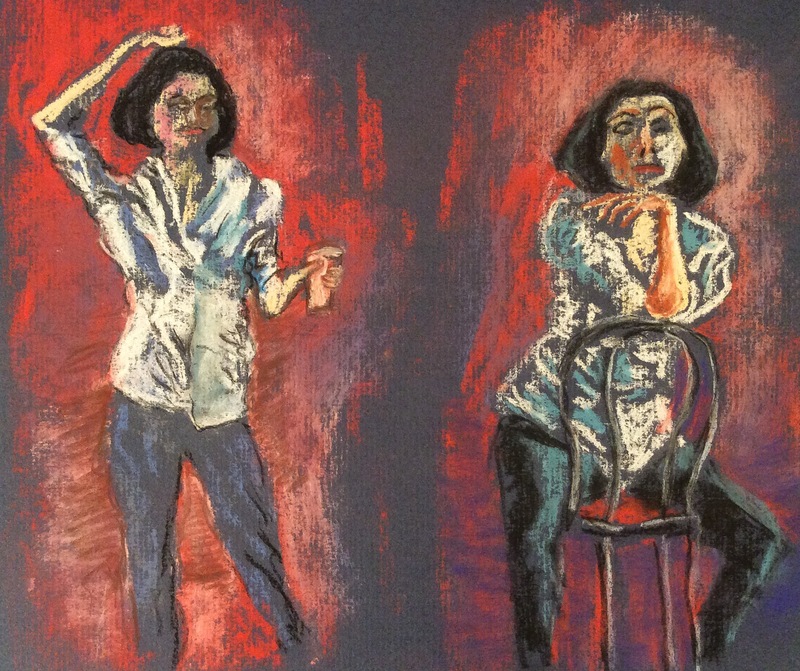 As the paper became really wet, colour sluiced off the sticks as an opaque wash but the earlier strokes drawn dry acted as a resist, keeping their integrity. Though unintended, I am pleased with the effects: the virgin paper in the midground represents a line of rushes glowing in the evening light. 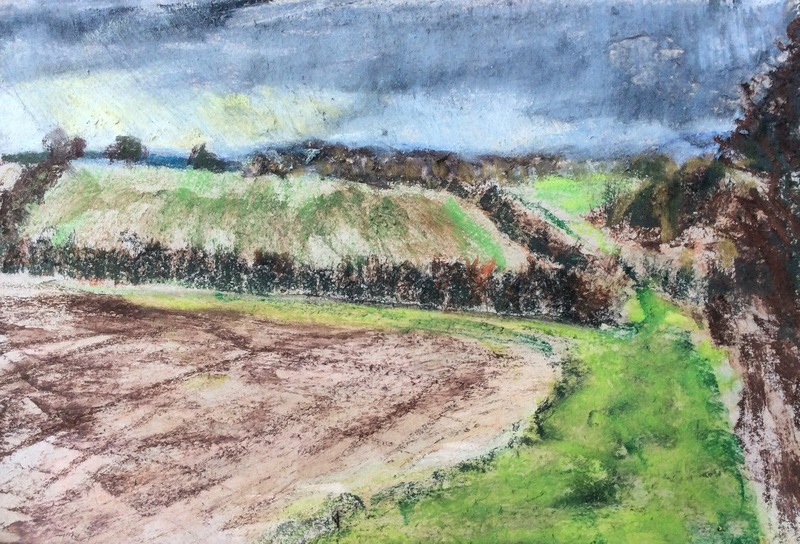 When I started the second sketch I was both wet and covered with mud all down my right side, having slid down a steep bank I was trying to climb. 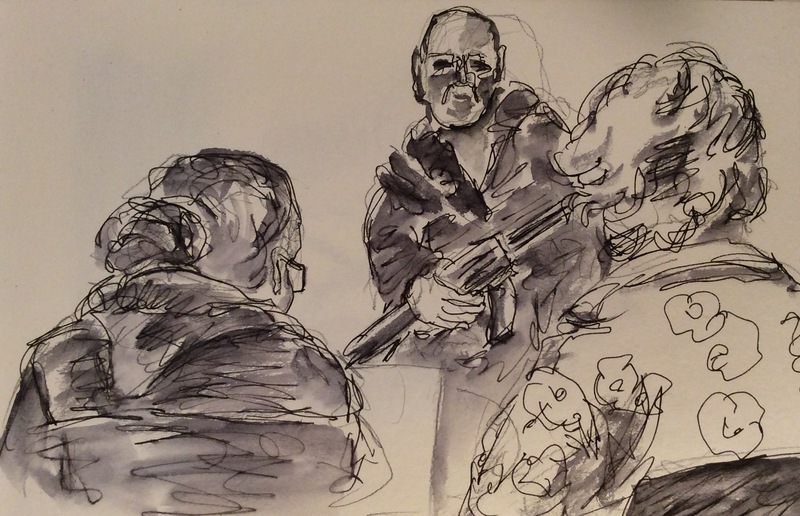 This image illustrates that if I want to draw in three tones, I must leave my colours at home. The paper’s tint was supposed to represent the foreground, but I had to keep adding to it, until no paper was left. This post was written to the haunting, beautiful Julia Wolfe’s Anthracite Fields, a musical discovery thanks to Spotify’s weekly selection for me. This post of Rosie’s stimulated me to try (again) to try to pare my drawings down to a few simple tones. 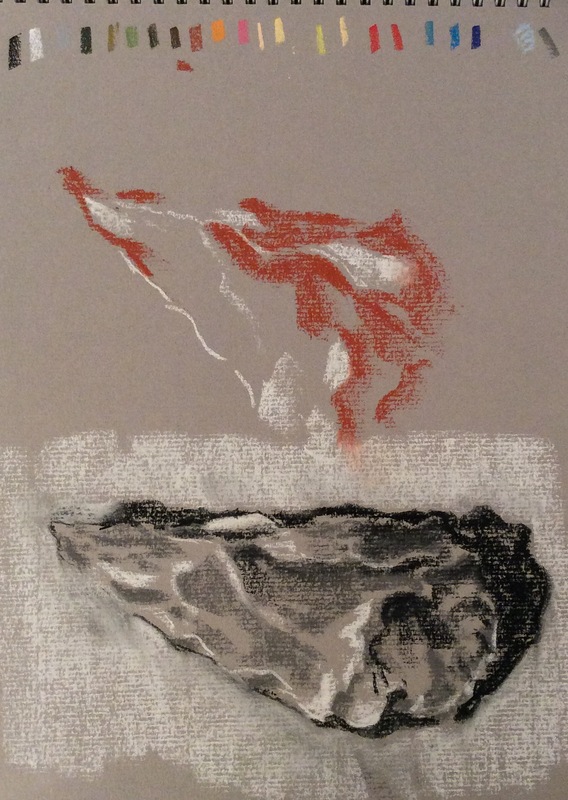 This well known but challenging technique requires tinted paper to provide mid tones and then the image is built using white and black plus one other tone, commonly the rich sanguine red chalk. 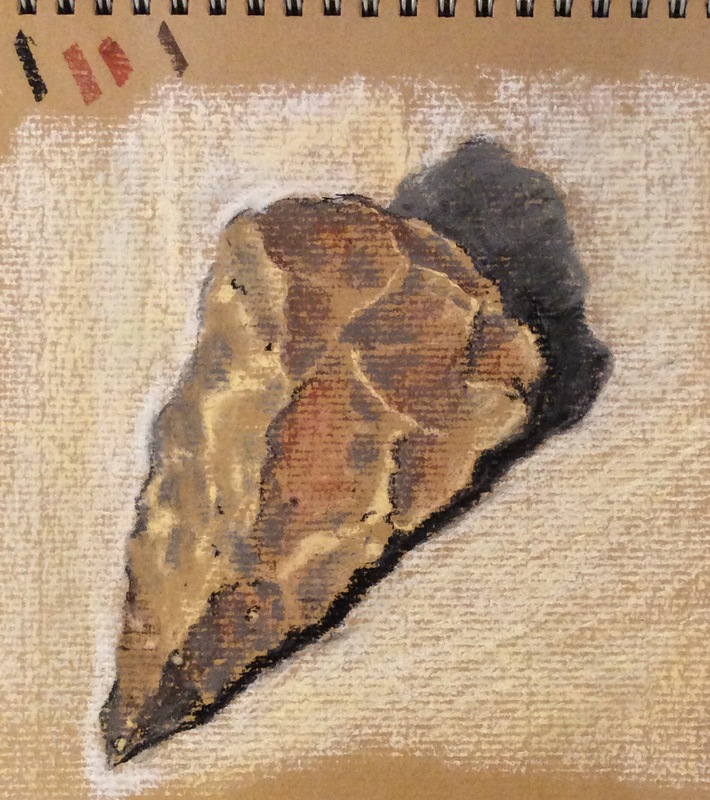 I made three attempts to draw this Neolithic hand axe in artificial light, drawing from inside the shape and leaving the shadow and outline to the end. In this, the third, I have ended up using seven tones including the paper. The first two are below, with marks as I tried to find the colours linked to the paper’s hue. 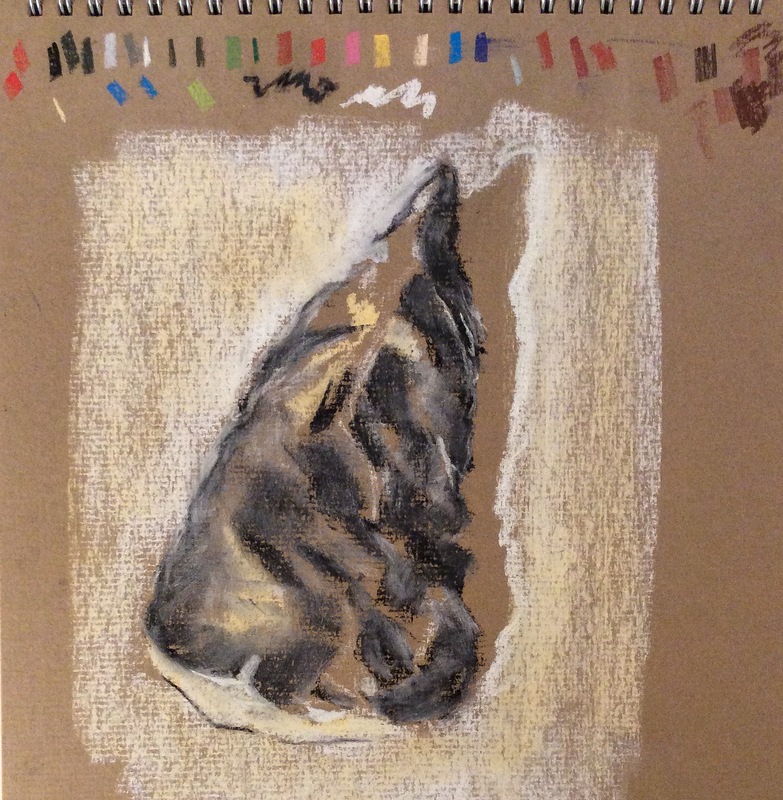 I have used the widely available Daler Rowney Ingres A4 pastel paper with a tooth laid in horizontal lines.